Board of Secondary Education (BSE), Odisha has published the Odisha Secondary School Teacher Eligibility Test (OSSTET 2018) Eligibility Criteria for candidates for the post of High School Teacher (Secondary Schools i.e Govt./ Aided/ Recognised Unaided Secondary Schools in the State of Odisha). 1. He or she must be a citizen of India. 2. Ability to Read and Write Odia. The candidate must be able to read and write in Odia. Any one of the following qualification will be taken into consideration to ascertain this ability of the candidate. (a) He/ she must have passed HSC Examination conducted by Board of Secondary Education, Odisha or an equivalent examination conducted by any other State Board or Central Board (like CBSE, ICSE) with Odia as a language subject i.e. First/ Second or Third Language. 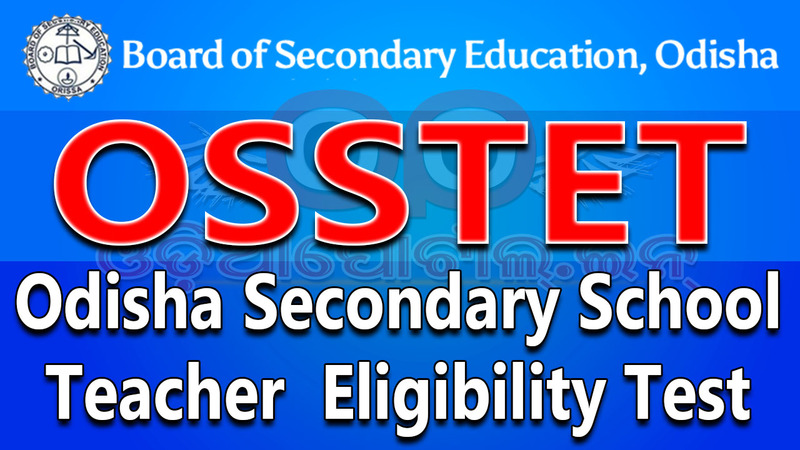 (b) He/ She must have passed +2/ Higher Secondary Examination conducted by Council of Higher Secondary Education, Odisha with Odia as an examination subject. (c) He must have passed Odia Examination of HSC/ 10th Standard Single Subject Examination conduct by the B.S.E., Odisha. In case the candidate desire to be language teacher like Hindi/ Classical Teachers (Sanskrit/ Telgu/ Urdu), passing Odia Examination of 07th Standard conducted by B.S.E., Odisha shall be allowed. Category I :- Education Teachers (Trained Graduate Teachers in Science/ Arts, Hindi/ Classical Teacher (Sanskrit/ Urdu/ Telugu). Category II :- Physical Education Teacher. Four year integrated B.A.B.Ed from NCTE recognised Institution with two school subjects as Honours/ Elective / Pass/ Optional (list of school subjects at annexure-I) having 50% marks in aggregate (45% for SC/ ST /PH / SEBC candidates). Bachelor’s Degree in science with two schools subject as Honours/ Elective / Pass/ Optional (list of school subjects at Annexure-I) from a recognized university having 50% marks in aggregate (45% for SC/ ST /PH / SEBC candidates). Four year integrated B.Sc.B.Ed from a NCTE Recognised Institution with two school subjects as Honours/ Elective / Pass/ Optional (list of school subjects at annexure-I) having 50% marks in aggregate (45% for SC/ ST/ PH/ SEBC candidates). Any one of the following training qualifications. a) Hindi Sikshyan Parangat from Kendriya Hindi Sansthan, Agra. b) B.H.Ed. a course prescribed by NCTE, from a recognized University/ Institution. c) B.Ed in Hindi, a course prescribed by NCTE , from Dakhin Bharat Hindi Prachar Sabha, Madras. b) Shastri (Hindi) from Orissa Rastrabhasa Parisad, Puri. c) Snataka (Acquired by June -2005, the date up to which the temporary recognition has been granted) from Hindi Sikshya Samiti, Odisha, Cuttack. c) B.Ed in Hindi, a course prescribed by NCTE, from Dakhin Bharat Hindi Prachar Sabha, Madras. Sikshya Shastri (Sanskrit), a course prescribed by NCTE, from a Recognised University/ Institution. Alim with 50% marks in aggregate (45% for PH candidates). B.Ed./ Urdu B.Ed. from a NCTE Recognised University/ Institution. Telugu B. Ed. from a University / Institution recognized by NCTE. +2 or its equivalent examination from a recognized institution with minimum 50% marks in aggregate (45% for SC/ ST/ PH/ SEBC) candidates). C.P.Ed./ B.P.Ed./ M.P.Ed. From a recognized Board/ University. The school subjects as per the list below should have been studied at the Graduation Level either as Honours/ Pass/ Elective/ Optional subject with not less than 200 marks. my qualification is BEd in pcm but due to some problem I was not apply osset before 11th Nov 2016 .I saw the last date for apply is extend for Sanskrit .can I apply? Continueing b.ed can I appear osstet ?? can I apply for ostet..